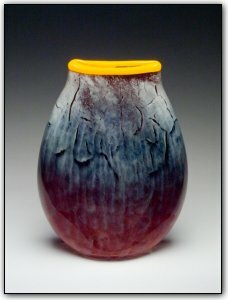 This faded red vase uses an especially complex color technique to achieve its stunning and unique look. First colored frit is added to the original bubble of glass, then it is encased with another layer of clear glass. Next another layer of powdered color is then added, and then the bubble is then dunked in water. By blowing into the bubble while it is still in the water, the bubble spreads the cracks made by the water allowing the inside color to show through. The piece was then flattened with cork paddles and finally a bright yellow lipwrap was added. A truly unique piece with a one of a kind color pattern that can never be duplicated exactly the same!